The research presented below is based on a content analysis by CARA student researcher Michael Budzinski (Georgetown Class of 2014). What is your pastor worried about? 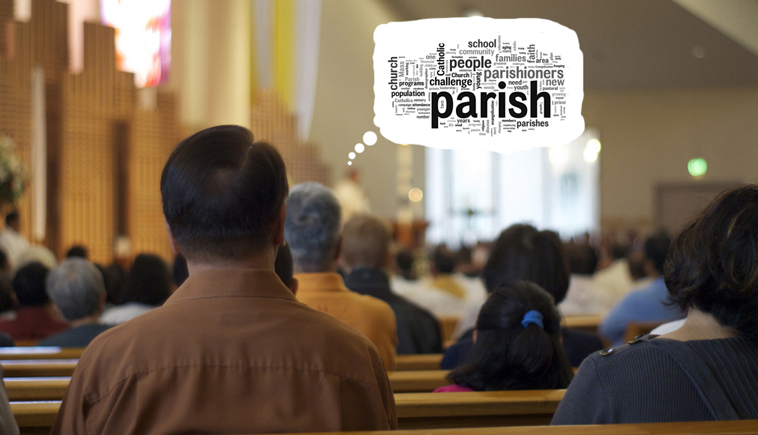 CARA recently asked a random sample of pastors in our National Survey of Catholic Parishes (NSCP), "What is the greatest challenge facing your parish in the next five years?" Each pastor could respond in their own words. These were then examined for common themes and content. First among their worries is finances. Twenty-one percent mentioned a financial issue as their top challenge. This strongly correlates with the 25% of parishes nationally that ran a budget deficit last year as estimated by the NSCP. This is also strongly related to the demographic changes described in our recent "Tale of Two Churches" post with parishes in the Northeast (32%) most likely to run a deficit and those in the South least likely to face this challenge (15%). Some of the representative "financial issues" comments from Northeastern and Midwestern pastors are shown below. Increasing costs of running a parish. Concerns about offertory and fundraising ability. We are struggling to survive financially. We are encouraging people to contribute more to the collection and examining the possibility of merging with another parish. Planning to get rid of a few old buildings and start new stewardship programs. The local economy, no jobs, high school and college graduates are not returning to the area. Declining numbers. Loss of young people. Number of aging parishioners. We are looking at how we can tighten budget due to the 'givers' declining in years. Fundraising. We will need to go to foundations. Parishioners are generous but limited in resources. Old facility needs some major repairs. Pray to find ways to bring in more revenue and save it for the future needs. Largest challenge is dealing with rising expenses and fewer parishioners. Finances. We are cutting staff. The building of a new and larger worship space. Parish growth is the problem. We plan to secure more land across the street for parking so we can build a larger church on our current lot. Our parish is a growing parish with many young persons. We are building a larger church and are currently in the middle of a capital campaign that has been very successful. Need more space. We are in the process of planning for the future. We are doing a pastoral plan that includes the need for more staffing in the parish and a multifunctional building or hall. Growth. Good problem! Building accommodations for classes, meetings, etc. Of course with that comes financial needs, building campaigns, etc. Increasing growth. More than a thousand houses are scheduled to be constructed in the area around the parish in the next few years. We need an addition to our church, doubling its capacity. Not enough space to continue to grow. We are raising funds to be able to buy more land. Limited parking and our solution would be to partner with nearby agencies to share parking on Sundays to take of our 'virtual members' of the parish who are worried about driving and not finding parking. We are in capital campaign to build a K-8 school, a 2,000 seat church, a 300 seat chapel, and administrative offices. Developing a partnership between three parishes. Overcoming fear that a parish will be closed. Being open to a decision which parish will be the center parish. The challenge of making partnerships. Because of the priest shortage we were forced into clusters but it was up to each cluster to determine how to function. Too often the cluster is looked at as a merge and the small parishes are getting gobbled up by the larger who believe they are entitled to all the best Mass times, staffing, preferences, etc. Also, comfort parishioners who are afraid that we will be closed. Sadly some have said they will simply move next door to the Lutheran Church where they have friends rather than travel 20 miles to the next Catholic church. We are clustered with four other parishes. The challenges facing us are the shortage of priests which comes the clustering/linking of parishes or closure. The challenge facing our parish in the next five years is the possible merger with two other churches. The office for these churches has merged and the bulletin has merged. We are proceeding with a unified approach, in hopes to unite the people of each church. Currently in the middle of the consolidation of six parishes into two, and eventually one. That is enough of a challenge for anyone; e.g. worship schedule too many buildings, real estate. Merging four parishes into a new parish having two worship sites. The parish covers two cities with very different demographics and economies. We engage people in listening sessions striving to provide good liturgies and activities bringing people together. Clustered with three other parishes. One of them has been closed. The number of priests is still shrinking in the diocese. There is anxiety about future leadership and configuration as some rearrangement has been happening each year somewhere in the diocese. Mostly we are in denial. People who are no longer practicing their faith regularly. We have established an Evangelization Team to work on the helping all to grow in their relationship to Christ and to invite back those who no longer actively worship with us. We are evaluating many initiatives to reach out to the "unchurched" and fallen away Catholics. Awakening the faith of the parishioners and those who do not join us on a regular basis. Continue to evangelize and spread the word. Growing Mass attendance and expand our volunteer base. Evangelizing parents. Many of our 30 to 45-year-olds don't know their faith. Retaining and attracting participants (especially on the younger end of the age spectrum). Reaching out to the 70% of registered parishioners who are not attending Mass regularly. No one is locked in to church. While we can count on some Catholics to be faithful no matter what, a growing portion of parishioners is fickle and choosy. Every weekend is an audition. Keeping young adults close to the church. Encourage young families to come to church and bring their children. Sports programs have become the churches for this group. Priest shortage. Pastor with multiple parishes. I expect that this parish will be closed when the diocese finalizes a plan to deal with declining priest population. Declining number of priests and deacons, especially those who can serve Hispanics and minorities. Priest shortage may cause combining of parishes. There is no longer a resident pastor and a handful of devoted parishioners are keeping the Catholic identity alive. Staff is part time and turns back half their salary in order to keep the place operational. Recruiting and training competent, capable parish volunteers. Not having a resident pastor or sharing one and having fewer liturgies. The need for someone other than the pastor to provide for adult formation and catechist training and liturgical music. We need professionally trained and salaried Adult Formation Director and Liturgical Musician. In the process of a complete merger. The primary challenge will be retaining the cultural/ethnic identities and the historical traditions moving forward, as well as redefining what it means for us to be parish. Bringing three diverse communities together in one parish: Anglo, Hispanic, and Vietnamese. They have evolved into three distinct communities which share very little in common. Aging congregation. Nothing I can do about it. Young people must leave for employment. Keep the school open. Our families are old. We have to find kids outside the parish. Our parish is changing due to an influx of immigrants. The older parishioners are not ready for the change because they see what is familiar changing fast. I basically have two parishes. One Anglo and the other Hispanic. Very difficult to merge the two. We have opportunities for the two communities to come together, but we don't have good participation. Demographics indicate that after high school, young people get as far away from this area as possible. It an old steel town that has not retooled itself and so they are few jobs and basically nothing to do around here. The consumer culture is a huge challenge to us. Young adults are too busy for church at this point in their lives. They look for more exciting places. Many of our families are 'transit' Catholics who go where it is convenient either because Mass is quicker or times are more convenient. They aren't engaged or attached to a parish until they want something. Maintaining Catholic identity in culture that rejects and openly mocks religion. The secular influence by schools and sport teams and other social events have made the Church far less than third class. Parishioners do not know each other. Dealing with people polarized on different church and political issues. We need to find and encourage people who have a preference for the 1962 Mass to come and join us. Keeping up with the integration of technology in the life of the parish. The NSCP included a series of questions, commissioned by St. John’s School of Theology Seminary, about the recently revised English-language Roman Missal. Results from the responses to these questions have gained some media attention. It is important to note that none of the NSCP respondents mentioned the revised Missal as a major challenge facing their parish in the responses to the open-ended question analyzed above. Thus, even though about half of priests say they don't like the revisions, few apparently see this as their most pressing problem. This could be because, as other CARA research has shown, an overwhelming majority of those in the pews agree that the revisions were good. Look for more results from the NSCP to be released by CARA soon. Also be sure to visit the Emerging Models of Pastoral Leadership research archive where you will find an enormous amount of related research on parish life in the United States. Parish image courtesy of Ryan Basilio. The addition of the thought bubble wordle is based on all of the responses to the challenge question. Do you want to know the best way to ensure your child grows up to be a faithful, knowledgeable, and active Catholic? It’s simple: 1) Raise them as a Protestant AND 2) Only let them date Catholics and promise to pay all their wedding and honeymoon expenses if they get married in the Catholic Church. That second step is key. All kidding aside (...that was not a serious attempt at Catholic parenting advice! ), there are hundreds of thousands of non-Catholic parents in the United States today raising children who will one day grow up to be extraordinary Catholics (...as shown below). Some will join in the coming week as the Catholic Church in the United States will welcome more than 100,000 new adult Catholics into the faith through the Rite of Christian Initiation of Adults (RCIA). There aren’t a lot of data sets available to study this sub-group. One notable exception is Dean R. Hoge’s Converts, Dropouts, Returnees: A Study of Religious Change Among Catholics (1981). Hoge, a Presbyterian sociologist, noted that “past research on Catholic converts and dropouts is sketchy, since few studies have been done” (p. 8). In recent years much new attention has been given to the dropouts—those who are raised in the faith but do not remain Catholic as adults (1, 2, 3, 4). In this post we focus on the converts joining the Church by compiling all of the recent research available to produce a robust and often surprising portrait. Hoge cites a 1954 study by Joseph H. Fichter, S.J. that estimated 75% of adult converts came to the Church through an interfaith marriage. In his own data collection in the 1980s Hoge found the most common path to conversion was marriage to a Catholic and this switch was most often facilitated by the spouse around the time of marriage. More recently, Pew’s Faith in Flux study indicates that a similar dynamic is still occurring today. 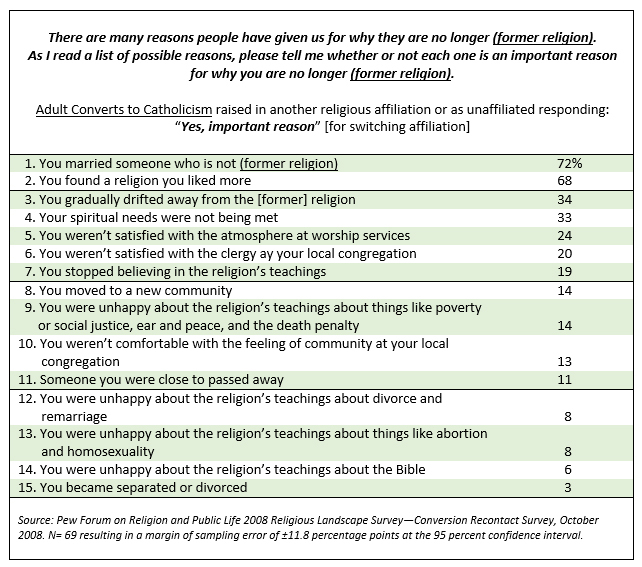 As shown in the table below, 72% of Catholic converts cite marriage as an important reason for their switch in faith. The second most commonly cited important reason is finding a religion they like more. Many appear to “find” this religion by marrying a Catholic. No other factors appear to be as important as marriage and liking the faith. Catholic converts turn out to be very unique among Americans who convert to another religion or to no affiliation. Very few other “switchers” cite marriage as being an important reason for their conversion. Many who leave the Catholic Church to become unaffiliated say they just “gradually drifted away” and those who leave for a Protestant denomination most often say their “spiritual needs were not being met” (pg. 6). Only 13% of former Catholics cite marriage to someone who is not Catholic as being an important reason for their conversion to another faith or having no religious affiliation. About one in ten adults (11%) we have surveyed in-pew at Masses nationally identify themselves as Catholic converts (source: Views from the Pews: Parishioner Evaluations of Parish Life in the United States). This is equivalent to about 1.9 million individuals. More broadly, about 7% of adult self-identified Catholics in the U.S. say they entered the faith as an adult (Catholic Media Use in the United States). This is equivalent to about 4 million individuals. It should be evident that the over-representation of converts in the pews (11% compared to 7% of all self-identified Catholics) means something… They are among the most active Catholics in the Church. And finally there is one more very telling and important difference. As we recently noted, many Catholics who do not believe in the Real Presence are unaware that the Church teaches the Real Presence. This appears to be a misunderstanding that is much more common among those who entered the faith as infants and children. 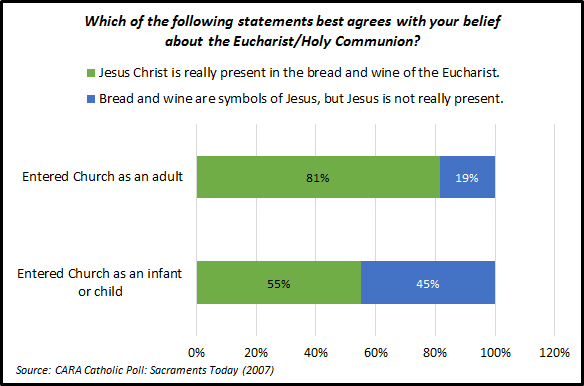 As shown below, eight in ten adult converts (81%) believe in the Real Presence compared to only 55% of all other Catholics. Why would adult converts be more knowledgeable and believing than other Catholics? Perhaps it was the eight months to a year they spent studying intensively in an RCIA program? As Pew has noted, “Those who have left Catholicism outnumber those who have joined the Catholic Church by nearly a four-to-one margin” (...this include minors who convert to Catholicism). This certainly never surprised me. The Church could gain more converts, similar to many Protestant denominations, if it lowered the requirements of entry. If one could just register and start receiving Communion you’d see many more “trying out” Catholicism. But many would not stay. It is the very commitment of RCIA, almost like a spiritual boot camp, that ends up creating active and knowledgeable Catholics. 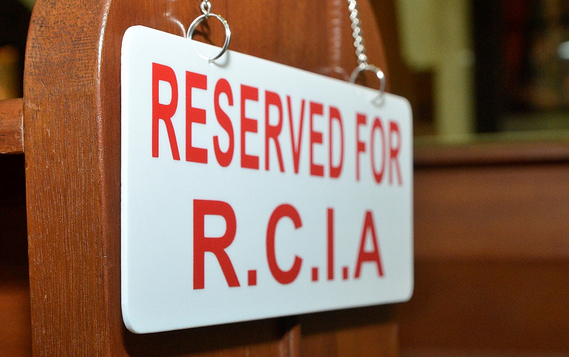 If all of the baptized are Catholicism’s “army,” the RCIA converts are its “special forces” (e.g., 13% of Catholic parish leaders, those working or volunteering in U.S. parishes, entered the faith as adults. Recall only 7% of self-identified Catholics are adult converts). 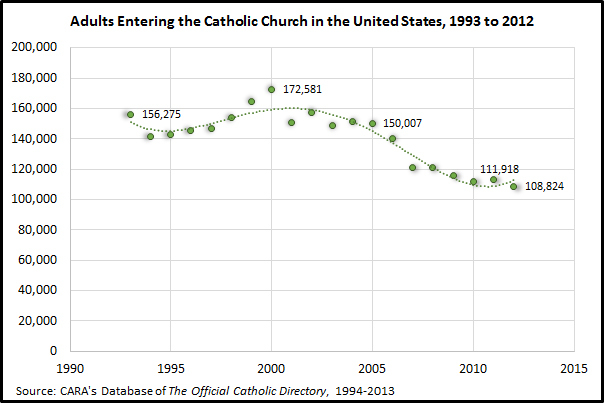 There are fewer Catholic converts than former Catholics but this certainly does not make them insignificant in number. 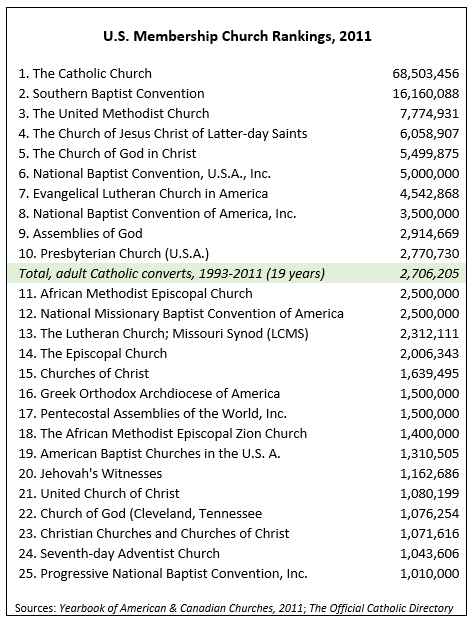 As shown in the table below, the total number of adults entering the Catholic faith from 1993 to 2011 numbers 2.7 million—nearly the same size as the entire Presbyterian Church U.S.A. denominational membership for 2011. At its peak in 2000, the Church welcomed more than 170,000 new adults into the faith in a single year. This number has declined since then and is now closer to 100,000 in recent years. However, just as fewer babies has led to fewer infant baptisms, the fewer marriages occurring in the U.S. may have also led to fewer conversions. There are also geographic points of interest. In CARA’s national polls of adult self-identified Catholics (CCPs) 35% of converts reside in the South compared to 27% of those entering the faith at a younger age. Only 20% of converts are in the Northeast compared to 27% of all other Catholics. Part of this again may be related to marriage. As we’ve shown previously, Catholics are significantly more likely to marry a non-Catholic in areas of the country with lower Catholic population percentages, such as the South. As shown below, among the top 15 dioceses with the highest rates of conversion (i.e., Catholics per convert in a three-year period; to control for differences in the sizes of dioceses and year-to-year fluctuations) are 12 dioceses in the Census Bureaus’ South region. One diocese outside the South is exceptional. In Steubenville (OH) there are 20 Catholics per convert. 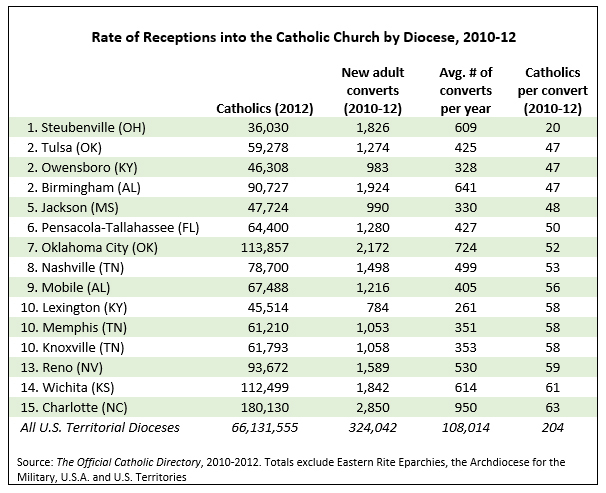 The next closest dioceses are at 47 Catholics per convert (Tulsa, OK; Owensboro, KY; and Birmingham, AL). Overall, across all dioceses the rate is 204 Catholics per convert (...the Archdiocese of Los Angeles typically welcomes more than 7,000 Catholic converts per year but this only amounts to about 196 Catholics per convert). There has been a lot of interest in whether more people have joined the Catholic Church under Pope Francis. Outside of former Catholics returning to the Church, this seems like a silly expectation to me. There are many non-Catholic religious leaders I admire but that has never made me want to convert. When it comes to conversions, the “Francis Effect” may not result in much. Something much more simple may be effective. If you are a single Catholic consider dating a non-Catholic and see where things go! They could end up being a better Catholic than you are. Update: The demographics and background of a “typical” adult convert to Catholicism: female (59%), non-Hispanic white (74%), married or widowed (74%), of the Post-Vatican II Generation born 1961-81 (36%), in the workforce (56%), and has attended college (54%). They are more likely (i.e., statistically significant difference) than cradle Catholics (i.e., baptized as infants) to be female (+9 percentage points), non-Hispanic white (+10 percentage points), and married or widowed (+12 percentage points). The positive impacts of the RCIA experience are somewhat similar to what CARA has previously identified for individuals attending Catholic colleges and universities. It appears that having an intensive religious education experience as an adult has a more lasting effect than relying on religious education in the childhood years alone. Reserved pew image courtesy of John Ragai.